If you live in Norfolk, or are just passing through this winter, have a look out for mistletoe. The Norfolk Wildlife Trust are appealing for sightings, to help them understand the current status and distribution of the plant in their county. You can find a pdf survey form here, and read more about the survey here. Printed forms are available by writing (with an SAE) to Mistletoe Survey, NWT, 22 Thorpe Road, Norwich, NR1 1RY. The survey runs until the end of January. Norfolk is well outside mistletoe’s main UK range, so there probably never was much of it in the area – but there are suggestions it is rarer than it was, particualrly with the loss of traditional apple orcahrds, the favourite host/habitat. I’ll be reviewing the national data over the winter – and will be passing on relevant info. I can think of several small populations in Suffolk – but that doesn’t count. But there is a good mistletoe population in an avenue of trees in a King’s Lynn Park. The big day is finally here – the first ever Tenbury Mistletoe Auction that’s not in Tenbury…. I’m there first, almost. At 0730 hours the place is dark, drizzly and cold. Remarkably similar to yesterday afternoon in fact (see last but one blog entry). Only Eric (one of Nick Champion’s staff) and a lone holly wreath seller in sight. Never mind, it all helps build the sense of expectation for the day, and I get to see the site fill with people and vehicles, at first slowly but increasingly chaotic from about 9.30 onwards. Holly Wreath sales being at 10.00, with mistletoe at 11.00. ITV want me to chat with David (pictured) and explain what it;s all about and why I’m a little obsessed (?) with mistletoe. 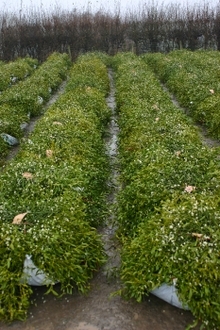 We have plenty of time and do a few takes walking up and down the mistletoe wraps laid out on the ground. But we eventually get a bit cold and inactive by about 9.15, so it’s a great relief when the crowds finally arrive. Lots of buyers and sellers – but v few of the bystanders we traditionally get at these dos – but that’s because we’re not in the middle of Tenbury. It’s more than a little controversial, this moving out of town, and when I venture into Tenbury later, around 12.30, several shop-keepers comment on how quiet the town is and what a shame, for the town and the auctions, that the 2 have parted company for this year. There’s a lot of speculation about what this means for the future. But at least the town still has the Mistletoe Festival. Anyway, back to the auctions – once Nick has started selling the holly wreaths and the crowds disperse away from the mistletoe I settle down to taking some pics in the mid-morning light (dunno why, i just do this every year, one day i’ll get the perfect mistletoe pic…). ITV are busy filming other bits and pieces and don’t need me anymore – but when I look up from the camera there they are again, filming me taking pics!! Lots of photographers about too – local (Shropshire Star) and national (London freelancers) – and with the crowds, the atmosphere is not to dissimilar to the traditional auction site in town. But where are the people with shopping bags, just popping in to have a quick look? And how much trade (snacks, lunches, coffees, papers, car-parking fees(!)) has Tenbury lost out on with the buyers all being here?. My worries (see recent blog entries and read this) about sustainable harvesting seem very relevant to some of the lots – whole tree branches with mistletoe attached (see pic) – now that is definitely not sustainable! Warming up at Alec Wall’s house in Tenbury Wells and discussing the arrangements for this Saturday’s Mistletoe Ball. (Tickets available from Alec on 01584 810479). We wonder whether Stan’s coming – so I ring him up. It’s exactly 17:20. He answers immediately, and when he realises it’s me says he’s expecting an urgent call, at 17:20 and would I ring off. But Stan I say, I only want to know whether you’re coming to the Ball. Ask me later he says, and rings off! But all is explained/revealed 30 minutes later when I’m on the road home, listening to BBC Radio 2 and the Chris Evans Show. Christoff is wittering on (as one does on radio) and suddenly says how nice it was to talk to the Mistletoe King just now. Of course! Stan was expecting the BBC – that’s why he was so bothered – and he’s been talking to Christoff about mistletoe. (Tuesday Postcript: Stan apologises for the abrupt phone call when we meet at the auctions, explains that he was due to talk on the radio to Chris Someone… Not Chris Evans? I say Yes, says Stan, Never heard of him before! (Sorry Chris!). Meanwhile, in a curious quirk of reverse media ageism my ‘Mistletoe Anorak’ piece appears in The Oldie magazine – the same day that Stan (74) speaks to the Chris Evans Show (popular with (30-)40-somethings like me). Off to Tenbury to make preparations for tomorrow’s auctions, particualrly for the media visits. I’m hoping to promote the Mistletoe Festival (which is on Saturday 1st) but I know very well that most of the media are only interested in the auctions, particularly this year’s changes – the auction has finally moved out of town from the old cattle market site. This is not a good thing for Tenbury – but has been expected for some years – see mistletoe Blogs passim. The official explanation for this year is that the Cattle Market site is virtually unusable – with Severn-Trent Water digging holes all over the place and various other problems, it’s probably just not practical to hold the auctions there. But the threat of redevelopment of the site is still real – and so this move out of town may not be temporary. So off I go to the new site which is on a sports ground close to little Hereford, a few miles to the west of Tenbury (and not to be confused with ‘Big’ Hereford – which is much further away to the SW). If you’re looking at the multimap link – the red circle marks the spot – I know that should be obvious but I had to explain this to a journalist yesterday… Obviously not an investigative one…. It’s a horrible day – dark, drizzling and generally cold. The site is, as Nick Champion has told me on the phone, large – plenty of space for the stock to be laid out and for vehicles to park, turn and (at the old site) to cause chaos during the auctions. Only Nick there today, surveying the newly arrived mistletoe stock in the rain (see pic – note the romantic dead lorry trailers in the mist). We have a brief chat, largely about the media due tomorrow (ITV This Morning and SKy News) and local orchards where they might go to see mistletoe au naturel. I have a few in mind already, Nick suggests some others and I toddle off to talk to the local farmers – ending up at (the slightly muddy) Little Hereford Farm where the Stevens have their dairy herd – and where there are mistletoe-filled orchards that they are quite happy for ITV to film on site in the morning. 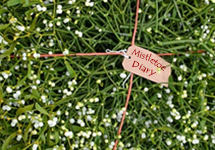 The weekend of the 24th/25th November – and the start of the mistletoe trading season. Newspaper coverage already in a small way – the Saturday editions of both the Telegraph and the Guardian carry pictures of Stan Yapp, Tenbury Wells’ Mistletoe Man, doing his harvesting for delivery to the Tuesday auctions. It’s been so busy on the mistletoe front over the last week or so I’ve not had time to blog, but here’s a brief, but important, announcement (other updates on what’s been going on will follow soon…). As part of my work to promote sustainable management of mistletoe I’ve just launched a modest initiative to find apple orchards which can be used to experiment with/demonstrate best practice. There’s no funding, yet, for this demonstration project, so I think it will start small – but I’ll be looking into possible grant-aid schemes soon. The initial plan is just to get the idea disseminated around orchard owners and conservation groups, hoping that some will volunteer their sites for this season. Full details are available in this pdf download – you’ll see I’m looking particularly at apple orchards in the "3 Counties" (Herefordshire, Worcestershire and Gloucestershire) where mistletoe is fairly pelntiful, but I’ll consider further afield too.